PHUKET: The recent deaths of a 10-year-old boy and his father in an accident on Patong Hill has again highlighted the road’s appalling safety record. In response, our new Governor Norraphat Plodthong called a… yawn… emergency meeting on improving road safety on the hill. The new Patong Police Chief Col Tassanai Orarigadech has also vowed that a tour company and its driver will face the full force of the law over their negligence which resulted in another fatal crash in the same place just two weeks ago. At the meeting, held on Tuesday (July 11), Patong Mayor Chalermluck Kebsup called for improvements to the section of the road in question – where the latest, and countless other, heavy vehicle accidents occurred. This despite her acknowledgement that the key causes of the accidents were lack of vehicle maintenance and poorly trained drivers. At the meeting Gov Norraphat ordered Phuket Provincial Chief Administrative Officer (Palad) Thawornwat Kongkaew to lead a… even longer yawn… committee to tackle the problem. The last thing we need is another committee to tell us what we already know. What we need is immediate multi-pronged action to tackle the well-known causes. 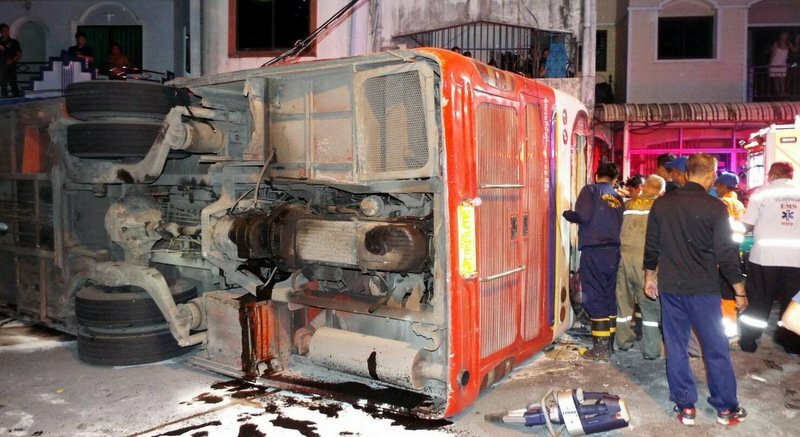 The endless merry-go-round of – crash – death – outrage – discussion – inaction – is the result of a total lack of continuity in the governance of Phuket. As each new governor is appointed, along with the new police chiefs and PLTO heads, they all approach the problem as if it had never been identified or discussed before. Previous attempts to establish check points to inspect heavy vehicles and restrict the times which they could use the Patong Hill road have never been consistent, and as such, have given no reason for vehicle operators to up their game. Serious charges are rarely laid (and even more rarely result in actual punishment) against drivers and their companies involved in accidents, fatal or not. Once again, re-enforcing the belief that no real consequences will have to be faced for allowing your poorly maintained and poorly driven vehicles in Phuket. Given she is a Patong local and has been in her role for several years, it is odd that Mayor Chalermluck’s response aims to build an “idiot proof” road instead of hoping the safety checks will be done and that drivers will be trained – and use their training. But it does bypass the problem of “responsible” officials changing every few months. Police stationed at all times to clear traffic to bottom while heavy vehicle waits, then descends unimpeded while brakes remain functional. They need to build a tunnel to Patong. This is the only way these accidents will be prevented. Human nature is not going to solve the problem for you. In this land of platitudes, where deeply ingrained self-oriented behaviour and a clear lack of what would be conisiderd in a 1st world country to be 'common sense' - I fear that this is a steeply uphill challenge (pardon the pun) that may never have an end to it. No matter how many deaths, no matter how many Governors, no matter who the Mayor is. Enforcing the current laws on driver qualification and vehicle safety and holding the bus operators/owners accountable are simply out of the question!